For the passenger ship, see MV Funchal. Funchal (Portuguese pronunciation: [fũˈʃal]) is the largest city, the municipal seat and the capital of Portugal's Autonomous Region of Madeira, bordered by the Atlantic Ocean. 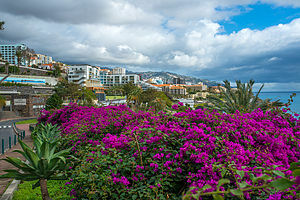 The city has a population of 111,892, making it the sixth largest city in Portugal, and has been the capital of Madeira for more than five centuries. Because of its high cultural and historical value, Funchal is one of Portugal's main tourist attractions. It is also popular as a destination for New Year's Eve, and it is the leading Portuguese port on cruise liner dockings. This settlement began around 1424, when the island was divided into two captaincies, and the zones that would become the urbanized core of Funchal would be founded by João Gonçalves Zarco who settled there with members of his family. Owing to its geographic location, the site became an important maritime port, whereas its productive soils became a focus of new settlers. Its coastal position, the most productive on the island, quickly permitted Funchal to develop an urban core and surpass the populations of other settlements, which slowly gravitated around it. In the early 15th century, Álvaro Fernandes was the commander of Funchal. As part of its administrative role, the settlement received its primary lighthouse between 1452 and 1454, when it was elevated to the status of vila and municipal seat. Funchal became an important transfer point for European commercial interests; many sailors and merchants located in Funchal in order to take advantage of the transient conditions of port. Christopher Columbus was one of the early settlers, but later many of the merchant families established commercial interests on the island, including: João d'Esmenaut from the Picardy region, the Lomelino from Genoa, the Mondragão from Biscay, the Acciauoli from Florence, the Bettencourts from France, the Lemilhana Berenguer from Valencia and many others. During the second half of the 15th century, the sugar industry expanded significantly along the southern coast, from Machico until Fajã da Ovelha, making Funchal the most important industrial centre of the industry. By the end of the century, fronting the Order of Christ, D. Manuel, Duke of Beja, expanded the support of the local community; he ordered the construction of the administrative Paços do Concelho and the Paços dos Tabeliães (completed in 1491), raised the construction of a church (began in 1493 and later raised to cathedral in 1514), and finally the construction of a hospital and customs-house in the village. In 1508, it was elevated to the status of city by King Manuel I of Portugal, and in 1514 (on completion of the Sé Cathedral) the bishopric was headquartered in Funchal. The island, and Funchal specifically, were vulnerable to privateer and pirate attacks. In September 1566, French corsairs under the command of Bertrand de Montluc, a gentleman in the court of Charles IX of France and second-son of Field Marshal Blaise de Montluc departed from Bordeaux with a force of 1200 men, on a small fleet of three main ships and eight support craft. The armada sacked Porto Santo. When the news was relayed to the settlements on Madeira and the villas of Machico and Santa Cruz the citizenry armed themselves for the inevitable. In Funchal, the governor, Francisco de Sales Gonçalves Zarco da Câmara, did not take any action that could be construed as hostile. Meanwhile, the armada anchored off the beach of Formosa, disembarked a contingent of 800 men that marched towards the city in three columns, encountering no resistance until the main bridge in São Paulo. At the bridge the privateers encountered a force from the small fort, with a few small-caliber pieces, which were quickly routed in confusion. At the road near Carreira, the attackers were confronted by a small group of Franciscan friars, who were quickly dispatched. Funchal's fortifications were finally assaulted by land, where its defense was thin; the defenders could not even reposition many of the cannons directed towards the sea. The city suffered a violent sack that lasted fifteen days, after which little remained. The following year, the military architect Mateus Fernandes III was sent to Funchal in order to completely modify the defensive system of the city. Evidence of the work produced by this architect was published in the "Mapa de Mateus Fernandes" (1573), considered to be the oldest plan of the island of Funchal. The document identifies the major defenses of the city, which included a large fortification in the area around the dyke in Pena. During the 16th century, Funchal was an important stop-over for caravels travelling between the Indies and the New World. The wine culture appeared during early settlement, through the incentives from Henry the Navigator. By 1455, the Venetian navigator, Luís de Cadamosto, on visiting Madeira, referred to the excellence of the Madeirense wines, principally the Malvasia castes from the island of Crete, which were being exported in greater numbers. By the end of the 16th century, the celebrated English poet and playwright, William Shakespeare, cited the important export and notoriety of the Madeiran Malvasia castes: in Richard III the Duke of Clarence, the brother of King Edward IV selected a death by drowning in a barrel of Madeira. Later, in Shakespeare's Henry IV he has Poins censure Falstaff for having sold his soul to the devil for a cup of Madeira wine. The growth of viticulture in Madeira expanded when the sugar industry was attacked by cheaper exports from the New World and Africa, but also from various epidemics and the after-effects of the 1566 privateer sacks. In the 17th century, commercial treaties with England brought increased investments to a business that was still insular. Many commercial wine-makers from England moved to the island, establishing a change in the commerce, the economy, the architectural morphology and the lifestyle of the community. This incremental growth expanded the city with new estates, and a new merchant class that populated the urban quarters. Generally, there were many new three-floor homes with an intermediary service floor, a floor for storage and wine-cellars, and in some cases a tower to watch the port and monitor shipping in the harbour. Various island governors and the convents participated in commercial viticulture. The Companhia de Jesus developed the vast estate of Campanário, which extended from the city to Fajã dos Padres into one of the most successful wines on the island, whereas the nuns of Santa Clara, owners of some large parcels of land, entered into the wine industry, financing the ships that would take their wines to Brazil (and exchanging them for sugar for their sweets business). But, during the 19th century there were epidemics, aggravating the economy and forcing some to return to sugar plantations. In order to maintain the level of development, many landowners tried to plant new more-resistant castes, but of an inferior quality, in order to support the industry. The city was twice bombarded by German U-boats during World War I. A few of the notable visitors to the region were Elisabeth, empress of Austria-Hungary, 1837–1898 (who travelled to the island for leisure and health), Charles I of Austria (who was exiled), Emperor of Austria and king of Hungary, 1867–1918, Polish Field Marshal Józef Piłsudski in order to recuperate his health, Winston Churchill (who travelled there on holidays and was known to have painted a few paintings during his visits) and Fulgencio Batista (who stopped over en route to his exile in Spain). 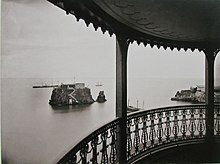 The presence of these notable visitors marked a period when Funchal became a center of tourism and therapeutic health. With the formal creation of the Port of Funchal, and later the establishment of the Santa Catarina Airport, Funchal turned into a major international tourist destination supported by a series of hotels and ocean-front residences. Early summer, especially June, tends to be quite infamous due to a phenomenon where persistent cloudiness covers the entire bay area of Funchal, locally nicknamed "Funchal's helmet". The length and severity of the rainy season varies greatly from year to year. Panoramic view of Funchal Bay during sunset, taken from Ponta do Garajau. The urbanized core of the city of Funchal includes several of the civil parishes that surround the municipality (Câmara de Lobos, Santa Cruz, Machico and Ribeira Brava), and includes a population of 150,000 inhabitants (representing the largest city outside mainland Portugal). 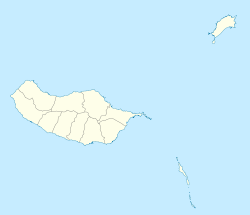 The municipality itself is a grouping of several smaller administrative entities, that includes Funchal, Câmara de Lobos, Caniço and Santa Cruz, located along the southern coast of Madeira. Funchal is a cosmopolitan and panoramic city, with parks, shops and hotels. Sé – the historical centre of Funchal, and most developed, including many of the older buildings; its population is less than 2148 residents (2001). Madeira Airport, often known as Funchal Airport (code: FNC), is located east of the city, in the municipality of Santa Cruz. The airport was one of the most dangerous airports in the world due to the limited flat space in close proximity to cliffs, but the extension of the runway on concrete pillars in the sea has improved safety. The Port of Funchal was the only major port in Madeira. Since 2007 it has been fully dedicated to passenger transport – cruise ships and ferries – and other tourist-related boats and yachts. In that year all remaining fishing activity and cargo trade was moved to the newly developed port of Caniçal, 12 mi (19 km) to the east. A ferry service between Funchal and Portimão, on the mainland, provided by Naviera Armas sailed weekly from 2008, but was discontinued in 2013 due to a dispute over harbour fees. In the summer of 2018 it was re-instated, but as a seasonal service from July to September, being operated by Grupo Sousa using Naviera Armas's ship called Volcán de Tijarafe, that provided the crossing prior to the 2013 discontinuation, with a maximum speed of 23 knots the crossing takes around 24 hours. A ferry runs in two hours between Funchal and Porto Santo Island, called the Lobo Marinho. 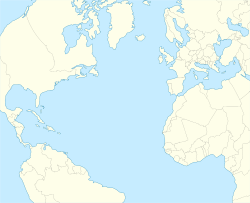 Funchal is frequently used as a stop-over by transatlantic ships, en route from Europe to the Caribbean, as it is the northern most Atlantic island that lies in the path of the Westerlies. Funchal has three Association Football clubs: Marítimo, Nacional and União. Together they form the Madeira derby which was first played in 1981 due to the teams being in different league levels for 7 decades. Since 2011, the project "ArT of opEN doors project in Rua de Santa Maria" has been implemented in Funchal:       . The aims of the project is to "open" the city to artistic and cultural events. The project was born by the hand of many artists who were coordinated with the city council and decided to take it out on the streets of the Old Town, particularly in the Rua de Santa Maria.The doors of houses, abandoned shops, deteriorated areas received a new life, in order to sensitize people, towards the art and culture that fills these spaces. Penha de França, western zone of Funchal. Sara Forbes Bonetta, goddaughter of Queen Victoria died of tuberculosis on 15 August 1880 in the city of Funchal, the capital of Madeira Island, a Portuguese island located in the Atlantic ocean. ^ "Climate summary: Funchal, Portugal". Weatherbase. Archived from the original on 20 September 2015. Retrieved 9 December 2014. ^ "Weather Information for Funchal". Archived from the original on 13 November 2012. ^ "Funchal Climate Normals 1961–1990". National Oceanic and Atmospheric Administration. Retrieved 10 March 2017. ^ "Portos da Madeira" (in Portuguese). Administração dos Portos da Região Autónoma da Madeira. Archived from the original on 15 April 2012. ^ "Ferry Madeira-Portimão: Bilhetes disponíveis a partir de hoje A primeira viagem realiza-se a 2 de julho mas os bilhetes vão estar disponíveis já a partir desta terça-feira (Vídeo)". Retrieved 13 June 2018. ^ "madeira-web.com – Things to do: "Lobo Marinho"". madeira-web.com. Archived from the original on 12 September 2017. Retrieved 2 May 2018. ^ "The Church". Holy Trinity Church, Funchal. 25 August 2010. Archived from the original on 24 February 2010. Retrieved 10 September 2010. ^ Dysch, Marcus (7 April 2009). "Madeira: Peace in the land of Ronaldo". The Jewish Chronicle Online. Archived from the original on 2 May 2010. Retrieved 10 September 2010. 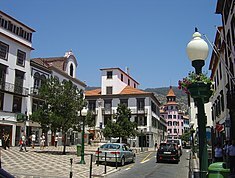 ^ "Geminações de Cidades e Vilas: Funchal" (in Portuguese). Associação Nacional de Municípios Portugueses. Retrieved 12 March 2015. ^ "Sister cities and international relations". City of Fremantle website. Archived from the original on 15 October 2012. Retrieved 22 May 2011. Fructuoso, Gaspar (1966) . Saudades da Terra (in Portuguese). 2. Ponta Delgada, Azores: Instituto Cultural de Ponta Delgada. This page was last edited on 9 April 2019, at 17:05 (UTC).